Lisa Nussbaum and her family. 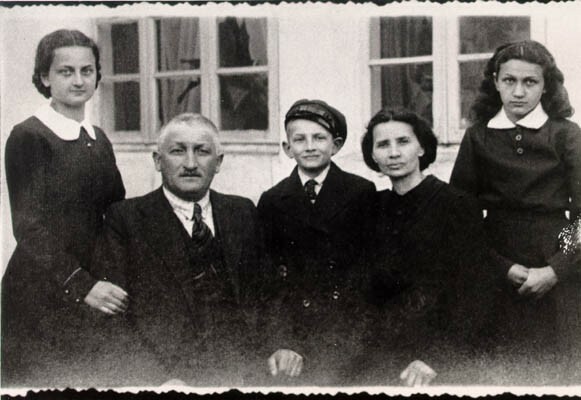 From left to right: Pola (sister), Herschel (father), Borushek (brother) Gittel (mother), and Lisa (about 13 years old in this photograph). Lisa's father exported geese to Germany for a living. Photograph taken in Raczki, Poland, ca. 1939. With the end of World War II and collapse of the Nazi regime, survivors of the Holocaust faced the daunting task of rebuilding their lives. With little in the way of financial resources and few, if any, surviving family members, most eventually emigrated from Europe to start their lives again. Between 1945 and 1952, more than 80,000 Holocaust survivors immigrated to the United States. [ ] was one of them.